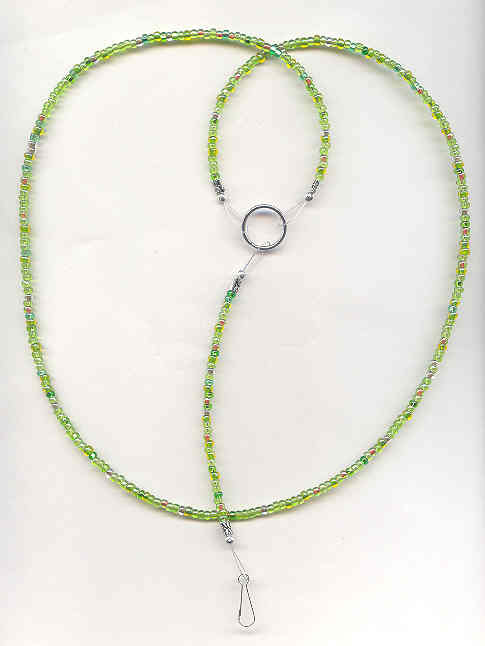 A lovely mix of transparent and silver-lined beads, the colours in this lanyard necklace are simply dazzling: peridot, mint, chartreuse, spring green ... it's got it all. I've added some "Bali silver lookalike" accents, a big split ring, and a clip to make the world's most versatile necklace. The necklace measures a comfortable 31", and the extender is about 5 1/2". All our one of a kind and limited edition artisan beaded jewelry is individually handcrafted in our studio in Los Angeles, California. Be sure to check out our other indie boutique jewelry styles and fashion accessories. Bracelets, necklaces and earrings in beautiful contemporary, vintage, antique and retro designs. The focal bead is a flattish round, about 23mm (15/16 inch) in diameter by 9mm (3/8 inch) thick.